This is a mammoth book. Twenty percent longer (227 pages), 208 contributors, 132 chapters. Whatever criticisms that I or anybody else may have, we must acknowledge Eduardo and his colleagues for bringing this mass of information together. 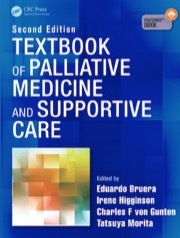 The book is divided into 18 Parts: 1 – Development of palliative medicine; 2 – Bioethics; 3 – Global research; 4 – Education; 5 – Research and audit; 6 – Organization and governance; 7 – Assessment; 8 – Pain; 9 – Gastrointestinal; 10 – Fatigue; 11 – Respiratory; 12 – Neuropsychiatric; 13 – Other problems; 14 – Emergencies; 15 – Specific conditions; 16 – Interdisciplinary issues; 17 - Effects of medical treatment; and 18 – Rehabilitation. As with the first edition, this book pays attention to the ‘big picture’ aspects of palliative medicine – development, organization, governance, audit, research and the like – and does so on a global scale. Reading the accounts of the history of palliative care in different regions, I was left wondering what proportion of the various populations had access to palliative care services; I would have regarded Canada as being amongst the leaders, but read recently that only 16 to 30 percent of the terminally ill have access to palliative care. The chapters on analgesia remain a little disorganized. There is still no chapter about non-opioid analgesics, although it does appear as a subheading in the chapter on the older adult. Buprenorphine has made it into the chapter on opioids, but not codeine, hydromorphone or tramadol. I looked at the chapter on spinal cord compression to see what dose of corticosteroid was recommended – evidence-based standard doses or the megadoses advocated in North America – but I could find no mention of corticosteroids. There are two separate chapters about palliative care for patients with HIV infection. Other clinical treatment chapters seem to have been improved and I liked the annotation of the references (primary articles, key reviews, and management guidelines), as well as the use of strength of evidence scores. Creating and editing this book must have been a nightmare. It is comprehensive in scope and the overall quality is very good. The continued development of continuous subcutaneous infusions (CSCIs) using syringe drivers is one of the achievements of palliative medicine. I note that the amount of information has escalated since the first edition of this book in 2002, which was a slim volume of just 157 pages. The lay-out is much the same as in previous editions. 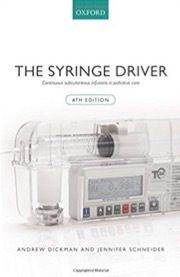 There are chapters on the pumps, stability and compatibility issues, drug information on 38 different drugs that might be given by CSCI, symptom control using the syringe driver, and a whopping 340-odd pages of compatibility and stability tables for combinations of from two to six drugs. This book should be available in any hospice or palliative care service where CSCIs are used, which probably means nearly all of them. The introductory chapters provide a good introduction to health literacy – what it is, why it is important, widely held misconceptions, and what may happen if it’s not there. Eleven differing definitions that have evolved over the last 20 years are given; the one that said most to me was the one that was included in the 2010 Affordable Care Act – ‘The degree to which an individual has the capacity to obtain, communicate, process, and understand basic health information and services to make appropriate health decisions.’ The importance of culturally sensitive patient-centered care is stressed. The next two sections deal in detail with oral and with written communication. 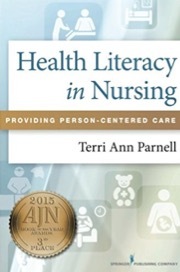 The final section is about health literacy in special populations and includes a chapter on End-of-Life and Palliative Care, written by Joanne Turnier, which made fascinating reading. It seems that problems related to health literacy might occur more frequently in end-of–life care and, when they do occur, may have more severe implications. ‘Health care providers often overestimate the health literacy skills of their patients, have difficulty recognizing patients with low health literacy, and do not understand the consequences that low health literacy has on health outcomes. Close to half of the U.S. adult population is unable to understand, act upon, or participate in their health care.’ Besides pointing to the faults, she does provide a number of ways in which palliative care can be made more person-friendly and understandable. I repeatedly write about the barriers, be they professional, institutional or societal, which prevent patients getting palliative care. Reading this book makes me think that perhaps we are at least partly responsible for the distrust people have in the care we offer. This book should be required reading for anyone involved in healthcare planning in palliative care, and may be of interest to others who work in the field and have an interest in administrative matters. Like the first edition, this Handbook is written by North Americans for North Americans. The amount of material it contains is impressive and it is well presented in an accessible form for the reader. There are chapters on pain and other physical symptoms, as well as the psychosocial, spiritual and ethical aspects of care. 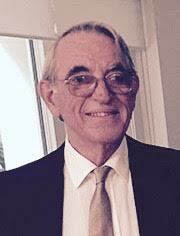 Separate chapters deal with pediatric and geriatric palliative care. An additional six chapters provide guidance on non-malignant disease (HIV, cardiac, hepatic, renal, neurological and pulmonary); the section on HIV/AIDS is more involved and helpful than the last edition of the Oxford Textbook. Many sections end with a useful list of clinical pearls. This edition is advertised as having a new section on grief and bereavement, but it includes only pediatric care and underlines the absence of a section on grief and bereavement for adult patients. There is also meant to be a new section on medical marijuana, but the only reference I found in the index was to cannabinoids as antiemetics, which is by no means new. I thought the section on Physician Assisted Dying (PAD) was very level-headed. This book will provide ready answers to clinical questions for anyone studying or working in palliative care, but the material is presented and set out in a way that would be useful to other healthcare professionals who may less often have to deal with problems involving palliative medicine. I have to admit this book has sat on my shelf for a while. The arrival of Lee’s Music at the Edge (see separate review) prodded my conscience. 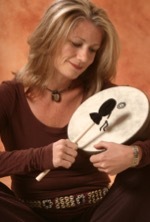 Christine Stevens describes herself as an author, music therapist, and founder of UpBeat Drum Circles. But the letters MSW and MT-BC after her name, which I presumed stood for Master of Social Work and Music Therapist-Board Certified, suggested there was more to Ms. Stevens. She argues that all human beings have music in them. She traces the link back thousands of years and reviews how today’s cutting edge technology is beginning to piece together the science of the relationship. She also argues that music can have a major effect on personal and professional development, and may have a significant ameliorating effect on medical problems like stress and anxiety. Then she teases apart the components of music – rhythm is medicine for the body, melody for the heart, harmony for the soul, and silence for the mind; that leaves the inner music, which is medicine for the spirit. Somewhere about this point, I realized that I was in way over my head and that this review was more a notification of the book’s availability and not a critical assessment of its content. But it sounded good to me. And a few questions asked of Google showed there is indeed a lot more to Ms. Stevens than suggested in the modest description in the book. ‘She is a modern day troubadour who introduces people all over the world to musical expression in the form of drum circles.’ She works as Director of Music Therapy and Wellness Programs at Remo Drum Company, the world’s largest manufacturer of drumheads. I found some of the video clips on YouTube – the following links – almost hypnotic. Some of the descriptions of her experiences are remarkable. She recalls singing ‘We Shall Overcome’ in a large crowd in Moscow Square during the Gorbachov era; I know that the generation before hers, the Baby Boomers, sang it and other anthems with just as much passion at the time of the Civil Rights movement and the anti-Vietnam War rallies. She describes leading a five-day drum circle-training workshop somewhere in the northern Iraqi warzone, conducted in what had been a torture chamber under Saddam Hussein but which had been converted to a youth activity center. And a 1,000-person drum circle? Wow! I’d like to be part of that. So, you might ask, what has this got to do with palliative care? Stevens provides a lot of information about the links between music and the mind, body and spirit, which reinforces the role of (side effect-free) music therapy in our patient population. But this book isn’t about clinical music therapy ­ – it’s more about personal and professional development and understanding. So if you feel the need for direction, a way to grow – check her out. How can music support the dying process, reduce caregivers’ stress, and provide non-verbal bonding between professionals, loved ones, and those in transition? 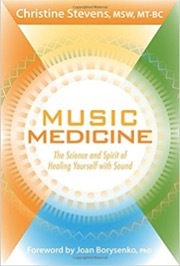 When I wrote ‘Music Medicine’, I wanted to create a book that sings; a soundtrack to the education of the four elements of music and how to use sound for self-healing. We included six FREE playlists on Sounds True's website with music curated by a professional music therapist. What do you need? Maybe it’s quiet background music, or upbeat rhythms after a long day by the bedside? Recently, as a friend’s partner was in hospice, I recommended the Silence Playlist. They texted me their favorite track – ‘Above the Clouds’. Music is such a personal thing. I invite you to read and listen and learn how to include music as medicine in your work, self-care, and life. Click here to view the online course for people to study music medicine. This book is a detailed account and analysis of the therapeutic relationship between a young music therapist (Lee) and an older, middle-aged professional pianist suffering AIDS called Francis. It took place at the London Lighthouse sometime in the early 1990s, before the new anti-retroviral drugs became available, at a time when a diagnosis of AIDS implied a short life expectancy. 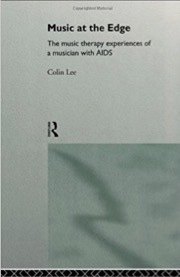 This book focuses on the effects of music therapy for Francis, but I could not help wondering if there was a second story going on – Lee was gay and the London Lighthouse in the early 1990s, where many young male homosexuals died, must have been a very challenging place to work, both psychologically and emotionally. But back to the music therapy. We are taken through it, session by session, with musical and verbal extracts from the recordings made. ‘We can follow his deepening release into musical freedom, his amazement and joy in creative achievement, his piloting journey of reconciliation and transformation toward the inevitability of death’ is how Clive Robbins describes it in his Foreword. And remember, the story is to be heard as well as read, and there are 15 audio extracts of the therapy sessions that can be downloaded from the publisher’s website. Lee is now Professor of Music Therapy at Wilfrid Laurier University in Waterloo, Ontario, Canada. The book is dedicated to his husband, Rainier. Music therapists, and anyone else who works in palliative care and has a particular interest in music therapy, may find this book to be of interest. This book, published in 2007, has been re-launched as an e-book. Here is what I said about the original . . . This is a narrative text based on interviews with 31 people who work in hospices, covering the whole range from directors to volunteers. Ann Richardson clearly describes the content of her book: it starts with a chapter describing what hospices do and why the care they provide is different from hospitals (Chapter 1). 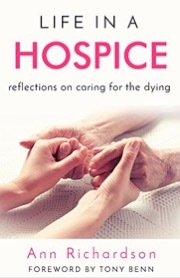 The first main section then describes the work undertaken in hospices (Chapters 2-5), including all aspects of patient care but with particular attention to the processes of helping dying people and supporting their relatives after a death. The next section (Chapters 6-8) explores the difficulties entailed in hospice work and the various means employed by staff to cope with them. The third section (Chapters 9-10) addresses the underlying question of why people undertake this work. 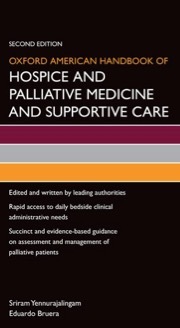 Finally, the last section (Chapters 11-12) offers some reflections on working in a hospice both in terms of practicalities and, more fundamentally, what has been learned from the experience. I liked this book because it brought hospice and palliative care to life. I did not necessarily agree with all the ideas and opinions given, but they provide material with which to reflect on your own hospice and practice. And I enjoyed it because of the way the material was set out and stitched together, which suggested a labor of love.